DES MOINES -- The chairman of Ron Paul’s 2012 presidential bid was sentenced Tuesday to probation and home confinement rather than prison, and two other top aides were awaiting their sentences for a scheme to cover up campaign payments to a former Iowa state senator who agreed to endorse their boss. Although prosecutors were seeking more than two years in federal prison, Jesse Benton was sentenced to two years’ probation and six months of home confinement, along with community service and a $10,000 fine. He was convicted of conspiracy, causing false campaign contribution reports to be filed to the Federal Election Commission and participating in a false statement scheme. Judge James Jarvey called the crimes serious and said Benton took advantage of the system designed to ensure transparency in how campaigns are financed. “There’s nothing like prison time to deter white collar activity,” Jarvey said, before announcing that he thought the lesser punishment was enough of a deterrent in Benton’s case. Prior to the sentencing announcement, Benton told the judge he had endured years of sleepless nights and public humiliation. He said his career is ruined and that he was forced to place his home on the market after going into debt. “A steep price has been paid,” he said. Benton and his attorney declined to comment as they left the courthouse. The campaign’s manager, John Tate, and deputy manager Dimitri Kesari also were convicted. Tate was also scheduled to be sentenced on Tuesday. Kesari’s sentencing is set for Wednesday morning. The men have argued they broke no laws when they paid a video production company, which passed on $73,000 to former state Sen. Kent Sorenson. He dropped support for Michele Bachmann and endorsed Paul six days before the 2012 Iowa caucuses. Prosecutors said it is illegal to cause a campaign to file inaccurate spending documents. The men said they were targeted because of their conservative politics and argued campaigns typically don’t identify payments to subcontractors of vendors. They are expected to appeal their convictions to the 8th U.S. Circuit Court of Appeals. If the judges rule against the men, they may choose to seek further review of the U.S. Supreme Court. The three men faced up to 35 years in prison had the judge handed down maximums to be served consecutively. 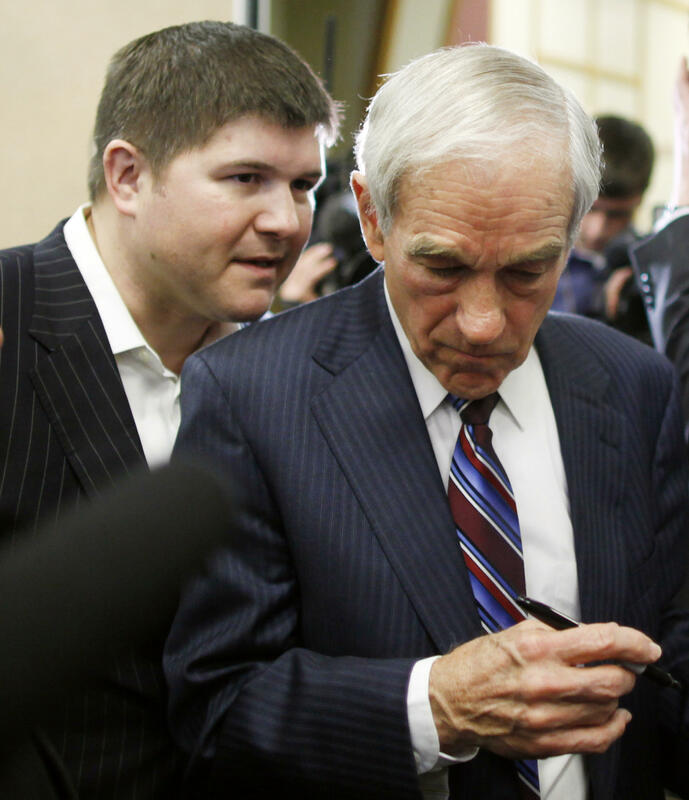 Benton, 38, of Louisville, Kentucky, is married to Ron Paul’s granddaughter, Valori Pyeatt. He also had managed the successful 2010 U.S. Senate campaign for Paul’s son, Rand Paul, in Kentucky and served as campaign manager for Sen. Mitch McConnell’s 2014 re-election, but resigned that summer as the investigation intensified in Iowa. Speaking before the men were sentenced, an Iowa political consultant said the case is a stark reminder to anyone in the early presidential contest states including Iowa, New Hampshire and South Carolina that they’ll be intensely watched and they should follow the rules carefully. “What you might get away with doing in a local state legislative campaigns can get you in really deep serious trouble on a presidential campaign if it’s exposed,” said Craig Robinson, who served on Steve Forbes’ presidential campaign in 2000, was state GOP director in 2008 and is publisher of the conservative “The Iowa Republican” blog.